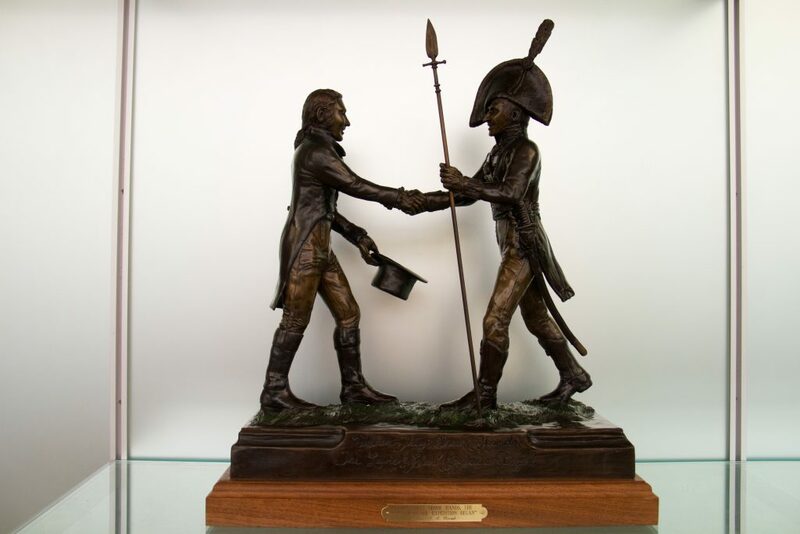 The bronze statue immortalizing the handshake between Meriwether Lewis and William Clark. NEW ALBANY, Ind. — One of the most significant moments in U.S. history was marked by a handshake. It happened when Meriwether Lewis met with William Clark in Louisville in 1803. When they shook hands at the Falls of the Ohio, the Lewis and Clark Expedition began. In commemoration of that moment, the Indiana University Southeast Center for Cultural Resources will dedicate a bronze statue immortalizing that handshake for permanent display in the IU Southeast Library. The ceremony will begin with an open house in the library at noon Sunday, Oct. 2, followed by the dedication program at 1 p.m. The ceremony will include the recognition of the handshake and statue’s significance to the region, the presentation of a resolution marking the statue’s permanent display in the library and the introduction of special guest Peyton “Bud” Clark, descendent of William Clark. Refreshments will be served. The program will conclude with tours of the Center for Cultural Resources (located inside the library) at 2 p.m.